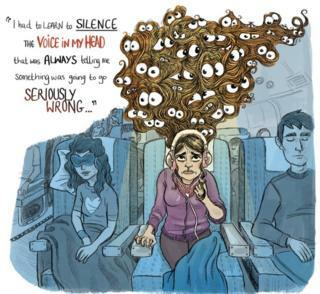 Travelling can be stressful at the best of times - but for those with mental health difficulties it can be overwhelming. Artist Loren Conner has anxiety and has worked with travellers to depict how they feel when they are about to embark on a trip. Lauren Juliff hit the headlines when she sold everything she owned and bought a one way ticket to travel the world. 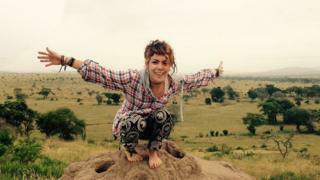 She has spent five years on the road and visited 60 countries, but she also has anxiety. Her first panic attack happened when she was 16 and she says at times it affected her so much she lost her job and boyfriend, but she slowly built herself up and decided to go on a solo trip. "Travelling feels like you're making a huge mistake. Everyone says to trust your intuition when you travel, but I had to learn to silence the voice in my head that was always telling me that something was going to go seriously wrong. "To my great surprise, it was forcing myself out of my comfort zone that helped me conquer my anxiety. It showed me that I was stronger and more capable than I ever imagined." Juliff says sticking to a routine gives her a "sense of control". "I'll set my alarm for the same time every day and then head out for a morning walk," she says. "Even though the location changes, the simple act of doing the same thing every morning helps me to feel less disorientated." Doug Leddin, a mental health blogger, revealed he had depression in a Facebook video which went viral last year. It was the first time many of his family and friends knew he was depressed. 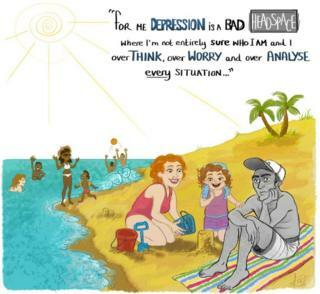 "Depression affects everyone in so many different ways. For me it's just a bad head space where I'm not entirely sure who I am and I over-think, over-worry and over-analyse every situation. "I get this horrible sensation in both my stomach and my head. 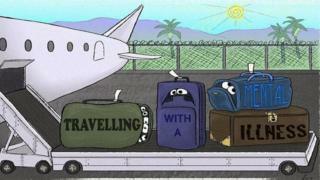 It's an uneasy feeling and that makes travelling really tough. "Travelling is doable, but you need to find out how to do it in a way that suits you and leaves you in full control of your situation and surroundings. Arriving early really helps me get settled." Investigative journalist Leanna was diagnosed with PTSD after she was pistol-whipped and attacked in an alley behind her apartment in 2012. "I noticed early on that shadows were a huge trigger," she says. 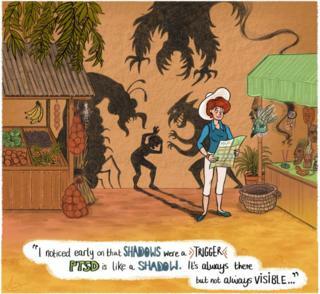 "PTSD is like a shadow. It's always there but not always visible. It's easy to dismiss when you're calm, but can manifest at any moment. She says the PTSD can cause a spike of anxiety, shaking, nausea or hyperventilation and "overtakes every other sense in your body." "It took two years for me to finally get the courage to take my first solo trip, but I was determined to move past my fear. "The key for me was preparation. I learned to think about the situation practically - never underestimate the secure feeling of a fully-charged phone." Daniel was diagnosed with ADHD aged five. It's a group of behavioural symptoms which include inattentiveness, hyperactivity and impulsiveness and can also cause problems with sleep and anxiety. 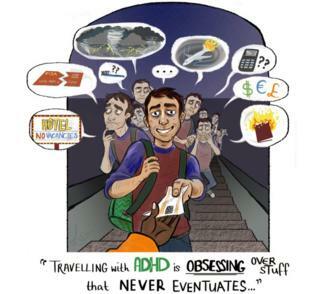 Daniel says: "Travelling with ADHD is obsessing over stuff that never eventuates, but just to make sure, I'd better run it through my mind 300 times and not sleep for three days prior with a complete loss of appetite." He says the bit he fears the most is "the stress of checking in baggage" and the responsibility of looking after his items. He now only takes a backpack with essentials such as his wallet, passport and phone, and reasons that if he needs anything else, he can buy it. Eighteen-year-old Ellen White is a mental health blogger and hopes to become a mental health nurse. She was diagnosed with OCD as a teenager. 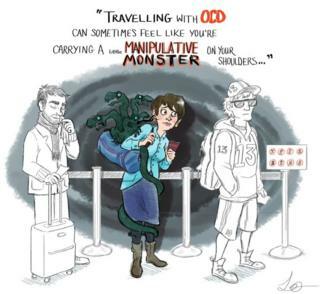 "Travelling with OCD at its worst can sometimes feel like you're carrying a little manipulative monster on your shoulders, constantly whispering negative thoughts and situations at every chance and not being able to shake it off," she says. "Yet at the same time luring you into a sense of security that the OCD thoughts and anxiety are perfectly logical." OCD manifests itself in two ways. Obsession relates to unwanted and unpleasant thoughts, images or urges that repeatedly enter your mind, while a compulsion is the repetitive behaviour you feel you need to carry out, to temporarily relieve the obsessive thought. Ellen says she used to struggle with separating her own thoughts and those formed by OCD and says by personifying it she can now recognise when OCD is taking over. "What helped me most about this was the fact that I now had a visual representation of that horrible voice in my head that would so often control my life." Ellen has found that while travelling "planning is key, so I can mentally prepare for any tricky situations that could arise". Loren Conner works as a freelance illustrator and enjoys drawing so much she took her sketchbook to Kenya instead of a camera. "I always had anxiety as a child. I always had a few moments of panic that I couldn't explain, and as I grew older I just realised it was part of me. "I have always used drawing to connect with myself. I find slowing down and taking that moment to create can see me through even the toughest of days." She says anxiety makes her feel as though she has been injected with adrenalin and finds going for a walk with her dog, until she is tired, helps expel excess energy. "The hardest part about travelling is getting over that initial fear and just booking it. My anxiety also comes out with the deadline that you have to be there 'or else'. "The night before I'm screaming inside, but once I'm through security I'm absolutely fine."